DOG ART realistic paintings of "man's or woman's best friend." Send a photo today, in days be hanging a hand painted portrait, of lasting beauty and sustainability. Expressions captured and portrayed, as you wish. 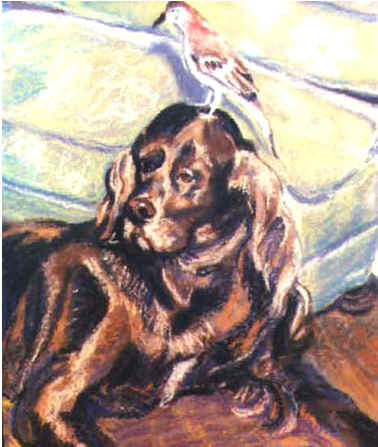 Portrait in Pastel of Bassett Hound 12" X 16"
Portrait in Pastel of two pet dogs 19.5 x 13.5"
Portrait in Acrylic Jake 16x20"
Portrait in Pastel of Dog and Bird. 18" X 24"
Have a custom portrait painted today!